Do you know that sitting is one of the most dangerous types of behavior you can do? Extended periods of sitting for any purpose, including work or leisure, increases the risk of death from many causes. A Scientific American article published the results of a 2009 study involving 17,000 participants. The amount of time they sat directly correlated to an elevated risk of cardiovascular problems, as well as other diseases. This held true even for participants who exercised regularly. The point of this study, and several others, is that sitting too long and too often is as bad for you as smoking or other unhealthy behavior. People who work long hours seated at a desk are unknowingly jeopardizing their health. Health experts recommend breaking up the work day by standing and taking brief but frequent breaks every hour or two to increase physical behavior. In addition, moving around periodically helps to prevent swelling in the back or legs that can make mobility uncomfortable. A short walk during a coffee break or at lunch can improve circulation and help to offset the disadvantages associated with long periods of seat time. Furthermore, most people spend considerable time watching television or using the computer. Children play more video games than previous generations. Activities like these are not conducive to active movement and exercise, but instead promote a sedentary lifestyle, which is not only unhealthy but may also become life-threatening. Even those who exercise up to an hour daily are typically seated or resting during the remaining twenty-three hours. Limited movement restricts blood flow and robs joints, bones, muscles, and tissues of necessary activity that promotes strength, endurance, and agility. Regular, sustained movement also encourages new cell growth and immune function enhancement. Brain function improves for clearer thinking, and mood enhancing hormones are released to help movers avoid negative emotions like depression, anger, or guilt. In 2009 Pennington Biomedical Research Center associate Dr. Peter Katzmarzyk published a study that identified a connection between sedentary behavior and mortality. Researchers found that individuals who spent the most time sitting were about 50% likelier to die during the follow-up period than participants who sat the least amount of time, despite control factors like age, gender, etc. Another longitudinal study conducted in Australia revealed an 11 percent increased risk of mortality for every hour spent watching TV without respect to gender, age, or physical activity. Additional studies linked sedentary behavior to health problems like obesity, heart disease, diabetes, and strokes. Yet, a recent study suggests that the quality of sedentary behavior also plays a role in health. The Australian Diabetes, Obesity and Lifestyle (AusDiab) Study involving 168 participants aged 30 to 87 years that was conducted by Genevieve Healy and associates found that sedentary behavior frequently interrupted by physical movement, such as getting up, standing, and walking around actually reduced waist circumference, body mass index, glucose tolerance, and blood lipids. The bottom line is that more physical behavior resulted in better health overall. A paper published about the European Youth Heart Study in Plos Medicine did not find a connection between physical behavior and television viewing in a study of almost 2,000 children and teens. Their findings suggest that it is more beneficial to sit less than to exercise more, or at least to take frequent breaks while seated than to remain seated for long periods of time, with or without exercise. Moving around helps to increase energy levels, which may encourage continued physical activity. Along with limited physical activity, prolonged inertia seems to encourage overeating. A recent American Journal of Public Health article revealed that TV viewing of programs with commercials, or advertisements, watched by children before age six appears to be linked to higher body weight five years later, despite adjusting for variables like socio-economic status and maternal BMI. Interestingly, kids that watched TV shows without commercials, such as a DVD or uninterrupted programming, did not gain extra weight in the ensuing study period. Eating high-calorie, non-nutritious food of the type often featured in TV commercials may suggest a learned behavior response from watching TV. Snacking is another behavior associated with TV viewing, compounding the health risks to sedentary viewers, and it is not usually associated as much with physical activity. In fact, many high-sugar, high-fat snacks actually reduce the body’s physical energy rather than increase it. Too much time spent in a chair can also lead to loss of body muscle tone. A fascinating study showed that a single day of complete rest without physical activity in lab rats resulted in significant reductions of muscle triglyceride uptake and HDL cholesterol (the good cholesterol). Similarly, a study performed on humans found that five days of bed rest led to increased plasma triglycerides and LDL cholesterol (the bad cholesterol), along with greater insulin resistance – all of which are detrimental to health. In short, an inert body loses energy without physical activity to utilize it. Reduced lipoprotein lipase, which is an enzyme that coordinates muscle uptake of fat, thus lowers the level of fat circulating in the bloodstream, along with cholesterol levels. Studies on animals revealed that lipoprotein lipase activity dropped dramatically after six hours of sitting. Unrelated to body fat or overall fitness, sedentary behavior can lead to changes like these in people who are obese or normal weight. Unfortunately, American culture utilizes sitting activity for many daily lifestyle behaviors. We sit as children, teens, and adults to study, work, and relax. Some studies suggest that children spend on average of six hours at home doing homework or playing sedentary games after sitting approximately six hours at school without much physical activity between the two. The long-term health risks are deeply concerning. Overall, as a society we should all be gravely concerned about the health implications of frequent sitting. Research conducted on animals shows that non-strenuous physical activity like basic walking at a regular pace can help to reverse the metabolic harm stemming from extended sitting. The facts appear to be clear that everyone should try to reduce the amount of time spent in a chair. 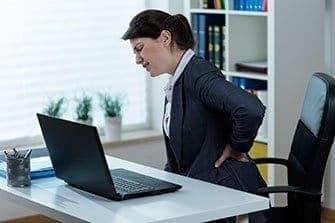 When we must be seated for hours at a time, for example at work or school, then it is important to remember to get up and take frequent short breaks to move around and combat the dangers of sitting too long. Motion feeds energy, increasing our awareness and mental activity. The bottom line is to remember that we have two legs for walking and one backside for sitting. Doubling movement time to expend energy and halving seated time can yield important health benefits for people of all ages, helping them to increase energy and enjoy physical activity throughout their lifetime. Starting at a young age, children should be encouraged to stay active and enjoy physical sports and activities to avoid becoming too sedentary.